I spent last week bouncing between work and writing book reviews for someone else. For reasons that I won't try and explain now I ended up reading a lot about herring in a very short space of time and it's left me a bit dazed and confused. It's also given me a craving for pickled herring, but that's another story. If I could have a few days to hole up with a good book I'd choose John Kerrigan's 'Shakespeare's Binding Language'. This turned up out of the blue courtesy of Oxford University Press (much more welcome than the banks postal contribution). The blurb says it "explores the significance in Shakespeare's plays of oaths, vows, contracts, pledges, and other utterances and acts by which characters commit themselves to the truth of things past, present, and to come." 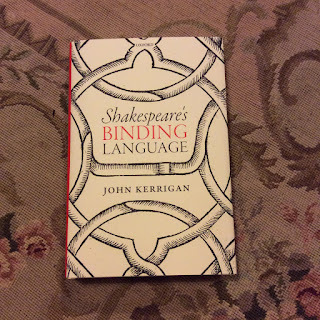 I really would like to get to grips with this, especially since discovering how much I enjoy Jacobean and restoration drama, because as the blurb goes on to say "In early modern England, such binding language was everywhere. Oaths of office, marriage vows, legal bonds, and casual, everyday profanity gave shape and texture to life. The proper use of language, and the extent of its power to bind, was argued over by lawyers, religious writers, and satirists, and these debates inform literature and drama." It's also a bit of a doorstop so it'll likely be a while before I find the time to tackle it properly. Never mind, one day it's time will come. 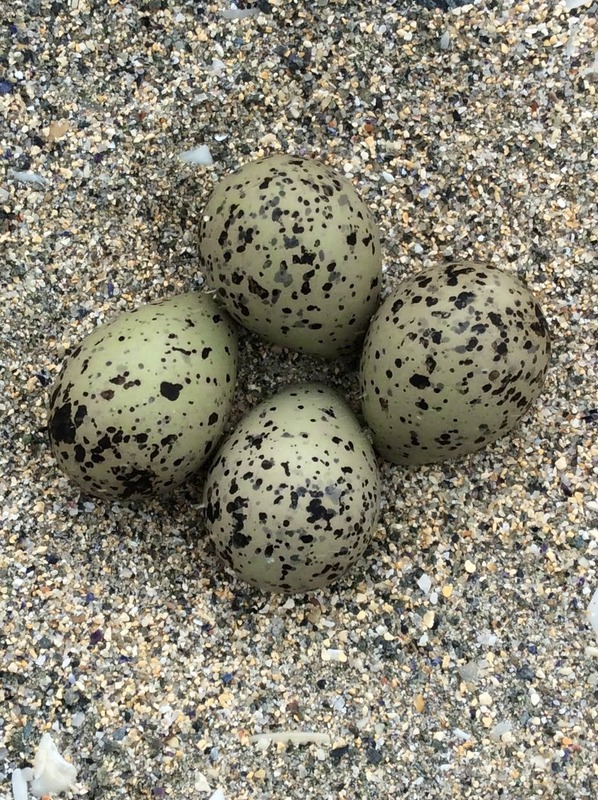 I wonder if it mentions herring at all? 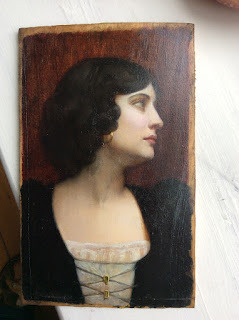 Having established that I have no idea who the woman in my painting is, and no information at hand that might help me work out who she is, I asked my father if he had any clues. He says not, but still though she might be his grandmother. I can say for sure she isn't, the date of 1896 means it was painted when she would have been between 14 and 15 years old, which was before she had met her future husband. Also hair and eyes are the wrong colour, she's much blonder in every other painting I've seen of her. 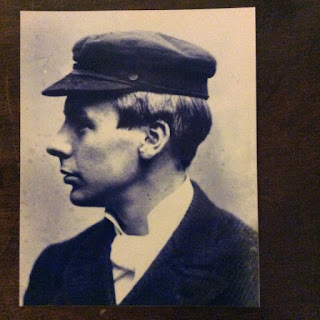 Meanwhile I've got some very bad photographs of pictures of the two brothers painted by Francis Swithin Anderton (F.S.A) which from memory both date from around 1900 which were also in the house. Next time I see them I must get better photos. I particularly like both of these for different reasons. First up is H.F.A painted by his brother as the respectable business man, JP, and general pillar of the community that he was. 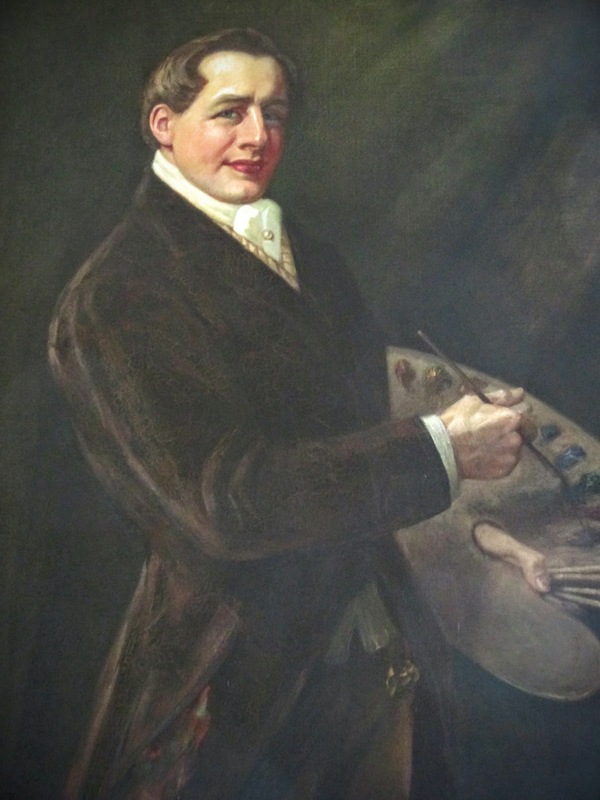 It strikes me as an affectionate portrait as well as one that wouldn't have looked out of place on a board room wall, and though you wouldn't know it from this picture, it's a really nice bit of painting. The phot below shows him again, the giant bird and a clear struggle not to giggle make him look like rather more fun. In life the colours are even more vivid, the suit (which looks like it's velvet) a deep wine colour, and the overall impression is of a man fresh from a debate with Oscar Wilde on the correct shade of carnation one could wear with such an outfit. There are discernible pentimenti so he obviously went to quite some trouble over this self portrait. The two pictures are also the same size with matching frames, and clearly meant to hang as a pair. The photo below (almost certainly not a mug shot) is him again. I really want to know him better. Kaggsy's Bookish Ramblings and Stuck in a Book are running another book club! This time the year is 1938, and I'm really quite excited by the prospect. 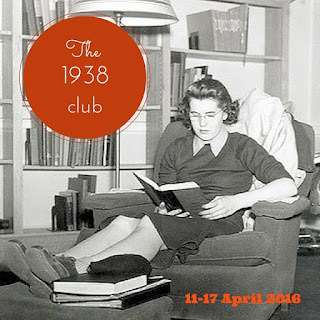 1938 should be a great year to choose books from, I know I already have a few I've been meaning to read and a few I'd like to re read. 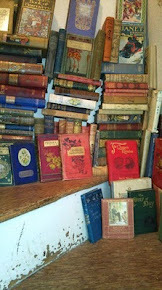 It may be that this is a good time to track down something from 1938 from a few authors I've been meaning to read too. It's not until April so with a bit of planning I'm rather hoping that I can read quite a bit for this one, and I'm really looking forward to seeing what others find too. So yes, excited basically covers it! It's very likely this post is going to contain spoilers, if that's a problem stop reading now! 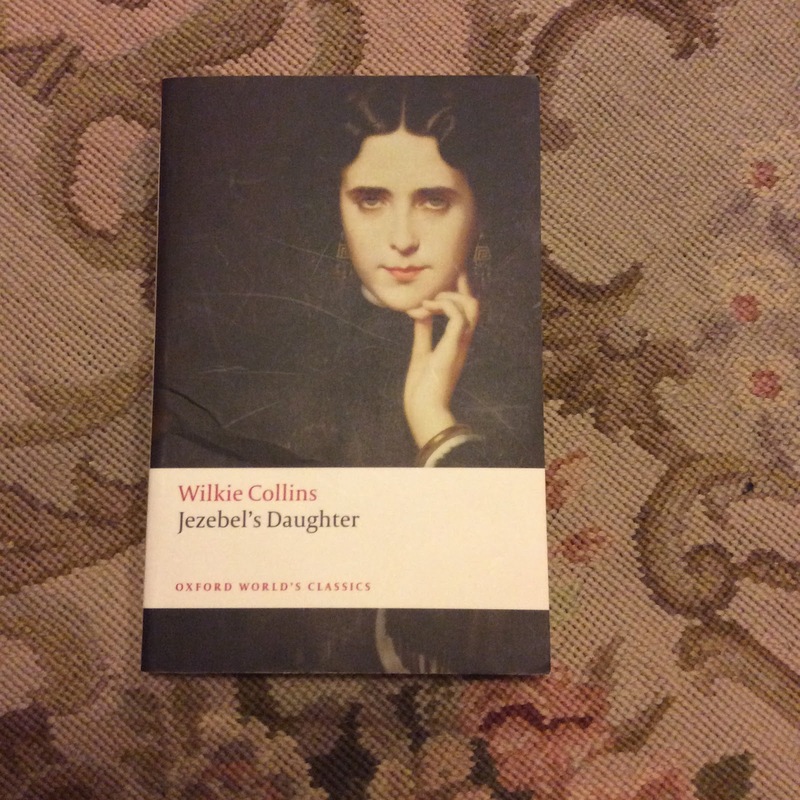 I've had a thing for Wilkie Collins since I was in my mid teens, there was a whole run of his books in my dad's house; as I recall they looked like a popular Victorian edition (green and gold covers), and I read a few of them over wet Shetland summers. Oddly, because I can't see why you would buy Collins if you weren't going to read him, the pages hadn't been cut on any of the ones I read. I wish I'd asked dad to keep them aside for me when the house was sold, they would have been nice to have. On the other hand the Oxford classics editions take up less space, have notes, and don't require a paper knife, so maybe it's better this way. What I've always loved about Collins is that he's fun; his books are full of gothic details and eccentricities, and that he confounds my preconceived notions of the Victorians generally. 'Jezebel's Daughter' is a splendid example of this. It might not be as innovative or accomplished as something like 'The Moonstone' or 'The Woman in White' but nonethe it does something really interesting. It is, essentially, a story of two powerful middle aged women. The Jezebel's daughter of the title refers to Minna Fontaine, an attractive and amiable young woman whose chance of happiness (In the form of marriage to a young man called Fritz) is being threatened. The Jezebel is Madame Fontaine, Minna's mother, the name an insult which about sums up her general popularity, and this is her story, hers and Mrs Wagner's. Mrs Wagner and Madame Fontaine become widows on the same day, Mrs Wagner inherits her husbands considerable business and his reforming ideals - it's her aim to promote employment for women in clerical positions within the company, and to reform the treatment of the insane. To this end she rescues an inmate of Bedlam who goes by the name of Jack Straw. Madame Fontaine's husband has been less successful, a professor who has devoted his life to the study of some obscure poisons, she's been left with debts and a daughter who is everything to her. She may also have pinched some poisons and antidotes. What we have then is one woman who holds all the economic power, and another who can choose life or death for those who cross her path. Madame Fontaine is a ruthless woman, one who's made mistakes, and one who seems all set to make more, but I feel Collins has real sympathy for her. Yes she may have run up debts, then lied about them, but her family cast her off when she married someone they didn't approve of, and he bleakly failed to live up to his side of the bargain by failing to provide either materially, or in lieu of that any outlets for his wife's talents. Meanwhile, Mrs Wagner may be a pattern card for every womanly virtue, but for all her excellent qualities she lacks the necessary compassion to understand her enemy - with dire consequences. The pivotal moment, for me at any rate, is when Mrs Wagner realises Madame Fontaine has stolen money from her to pay her debts. The discovery of those debts would mean Minna's marriage to Fritz was off, the wider discovery of the theft would obviously mean the same, and more - if Minna's mother us known as a thief what respectable future is open to Minna? To Mrs Wagner the difference between right and wrong is black and white, consequences be damned. She simply can't understand the desperation that led to the crime in question, and because she doesn't understand it, she can't imagine the lengths Madame Fontaine might go to when she's truly cornered. Collins, of course, can and does imagine it - in fine gothic detail to boot, and in Madame Fontaine he creates a character who neatly illustrates the shortcomings of a woman's position in the 1820's. Here is an intelligent, capable, ambitious woman who is thwarted at every turn, with no respectable outlet for her talants or ambitions she becomes embittered and isolated. A dangerous combination. I love Collins in this mood, it may not be his best work, but its a gripping book to read, and at its heart is something really interesting. Women may have more options now, but the difference between the haves and have nots really hasn't changed at all. 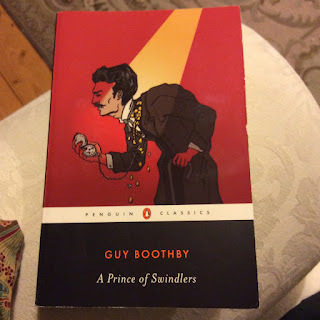 'The Penguin Book of Gaslight Crime' edited by Micheal Sim's was a particular treat a few years ago, and ever since I've looked out for these particular penguin editions of vintage crime - often dealing with swindlers and con men rather then murderers. So far I've not been disappointed - though for reasons I don't understand they're always American editions (why do they have softer covers?). 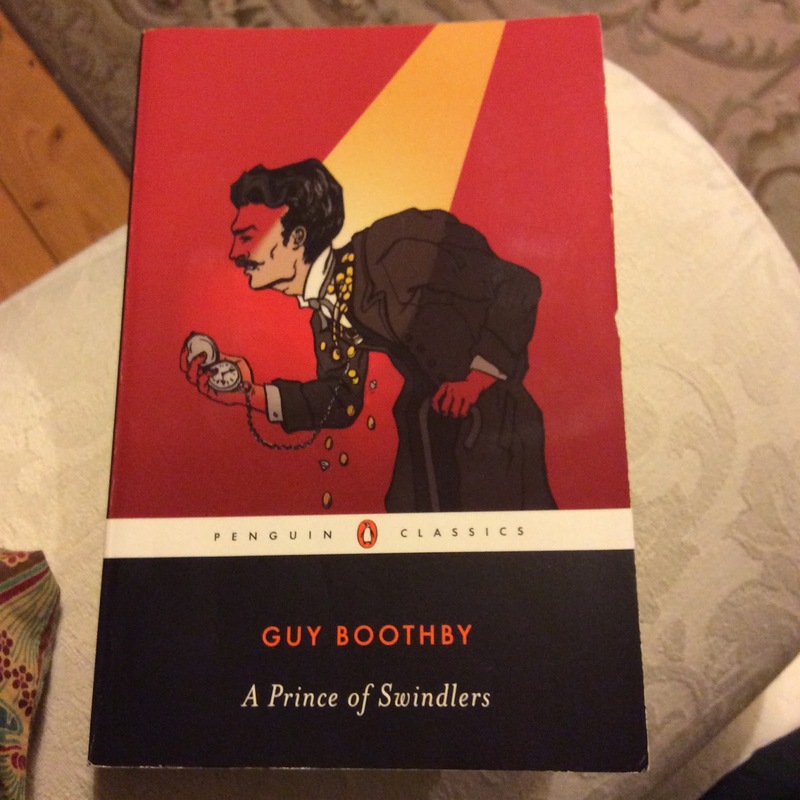 Guy Boothby's 'A Prince of Swindlers' was a happy find in the Birmingham branch of Waterstones (excellent coffee shop as well as being a very smart bookshop) and kept me entertained on one of the very many wet afternoons that this winter has seen fit to provide (and so often on my days off too). It reminds me a lot of Grant Allen's 'An African Millionare' (which of the two I slightly prefer) and that's a very good thing indeed. Boothby's gentleman villain is the mysterious Simon Carne, ably assisted by his butler, Belton. 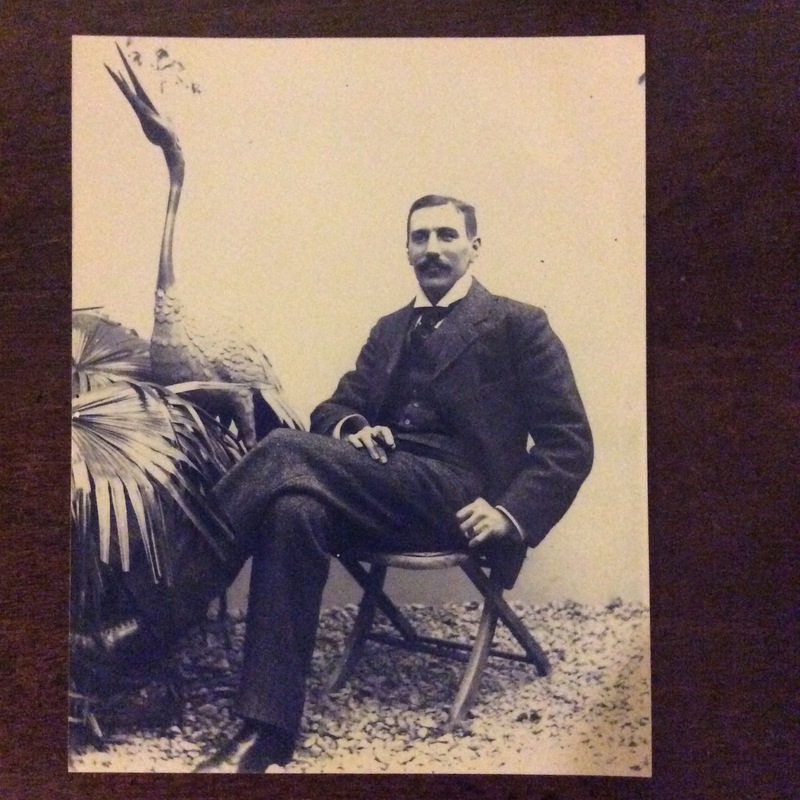 Having met and charmed the British Viceroy in India, Carne travels to London where that same viceroy and his wife introduce him into society - little do they know what they've done. What follows is a half dozen audacious swindles carried out against the very highest members of society (always satisfying) by Carne, who as well as being a master of disguise and strategy, clearly knows no fear. It's best read in instalments, which I assume is how the stories originally appeared (I should read the introduction) as each chapter runs along broadly similar lines. That doesn't stop it being both a rattling good yarn (a suitably period description I feel) and engagingly funny. I can't say much more without giving spoilers, but it's all good Edwardian fun and an excellent addition to what I think of as my gaslight crime collection. This little book was a present from my father and stepmother over New Year. They have obviously noticed my love of gin (Christmas present from them was 2 half bottles of Shetland Reel gin, one of which is flavoured with seaweed - yet to be tried). 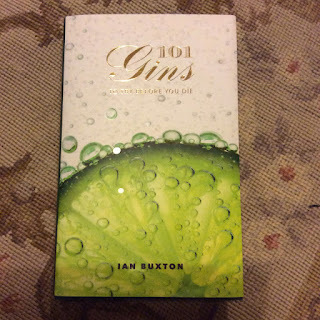 I'm grateful for the book as I was in two minds about buying it myself, on the one hand it's about gin, on the other 'before you die' has an ominous ring to it that just winds me up. The gin market is in overdrive at the moment however, with brands multiplying like rabbits and no sign of things slowing down, so a guide book of any kind is worth a glance and I really like this one. It's a sensible, as well as an unashamedly personal selection. Aldi's own label gin appears as does Beefeater, Gordon's, and Greenall's alongside more expensive and exclusive products. I think this is important for a couple of reasons, the first being that modestly priced, widely available, products are the obvious end of the market to start exploring something like gin from. The second reason is that for anyone my age or older these were the usually the only gins to be had. For me Gordon's or Beefeater will always be the benchmark, because although (like Buxton) I don't especially rate Gordon's I've drunk so much of it over the years that sometimes nothing else will do. (Beefeater is better, Buxton and I agree on that too). Unlike whisky, the difference between the majority of gins, especially if they all say something like 'London Dry' on the label, is subtle which makes it perfect to keep on experimenting with. It's a few years since I've bought a second bottle of anything, preferring instead to try something new each time. (Though if I had to stick with only one gin for the rest of my life it would probably be Berry Bros No3, I love an old fashioned juniper heavy gin). I'm normally happy to pay up to £35 for a bottle, much happier to pay somewhat less, and totally unwilling to pay more. I don't drink a lot so a bottle will last a reasonable length of time hence the willingness to pay a bit, but as with collecting anything it makes sense to set a spending limit. Limit set, gin makes quite a nice souvenir of a day out - everywhere seems to be making one now - so it turns out to be very easy indeed to find you've accumulated more than a dozen bottles. And when you reach that point there's no turning back. 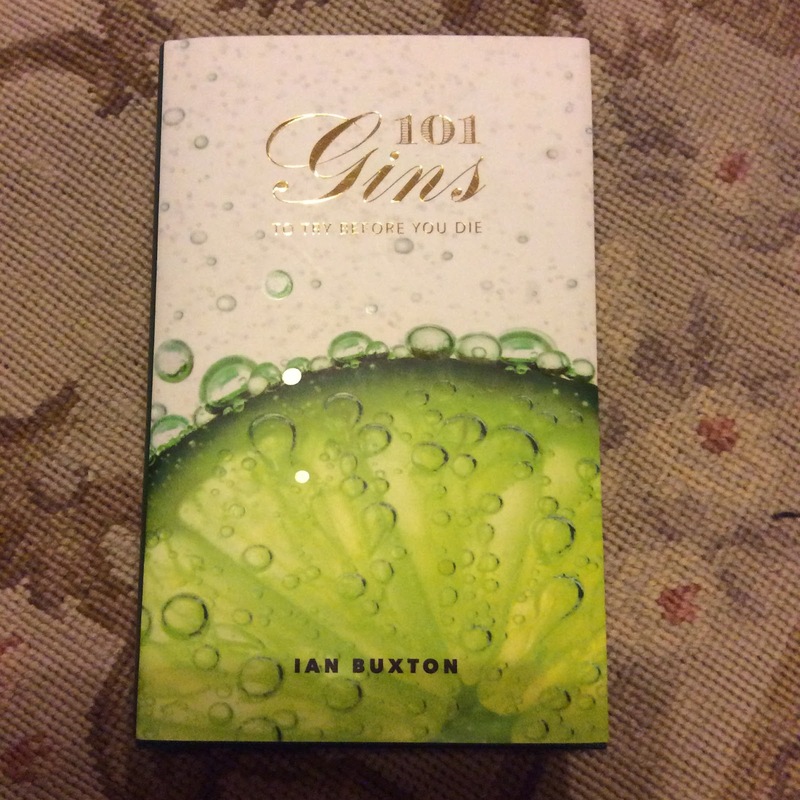 I've tried just over 30 of the gins in this book, and quite a few which aren't in there too. It has plenty that I've thought about buying but not been quite convinced about, so having a review is useful. In short it's a well written, informative, funny, little book that it's easy to lose yourself in for an hour or two at a time and which is providing plenty of inspiration for my next purchase. A must for any gin lover! If there's one thing I'm more inclined to spend money on than books, it's art (if there's a thing I wish I'd worked harder at, as well as having more natural talent for, it's also art - but never mind) maybe in part because I grew up with a plenty of it around. 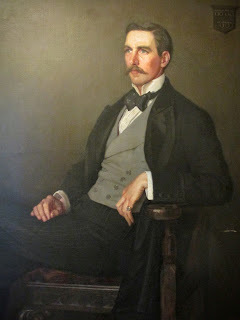 My great grandfather (Francis Swithin Anderton) was a painter, he died in 1909 when he was 41, just before my grandfather was born, regrettably all I really know of him is a handful of portraits that my father has, a few photos of more portraits scattered around the family, and more contemporary photos that show him and others dressed up - presumably prior to being painted, but maybe just for fun. It's more than enough to be intriguing but sadly it's all I have. Well, almost all I have. 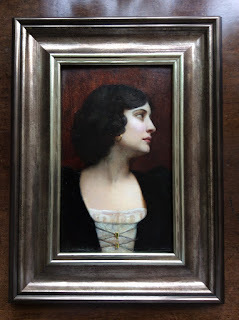 One of the portraits that dad had - a small study on board of an unknown woman's head - got damaged when something went badly wrong with a boiler and the cupboard she was stored in got flooded. Since then she had been stuck at the back of more cupboards and had probably come to feel quite neglected. Then over new year she came up in conversation and we agreed that if I got her restored I could keep her (no more cupboards). A few days after we got home she arrived in the post. Unwrapping her was a nervous moment, partly because it was a long time since I'd seen her and I couldn't remember how bad the damage was, and partly because I've seen how my postman treats books. Fortunately he takes better care of pictures. After that it was a case of finding a restorer. 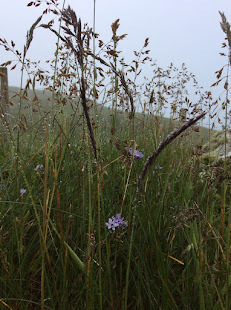 Dad recommended someone good in the borders but I wanted someone local - once I'd got my hands on her I was impatient to start the process and to get her back, but it also needed to be someone who came with decent recommendations. In the end I called a couple of galleries and when they both suggested the same person I was happy to go to her. I was not disappointed with the result, and even happier that the eventual cost was comfortably below the initial quote. The next step was to get a frame, I remember her on the wall when I was a child, but not her frame. Dad recalled something ornate and gold coloured, and with luck one day I might come accross a suitable period frame, but for now I wanted something reasonably broad but also plain. D doesn't like my choice, but after spending quite a lot of time with the framer exploring different colours, widths, and styles, I'm happy that I made the right choice. And here she is (sitting on a table, I don't have panelled walls). 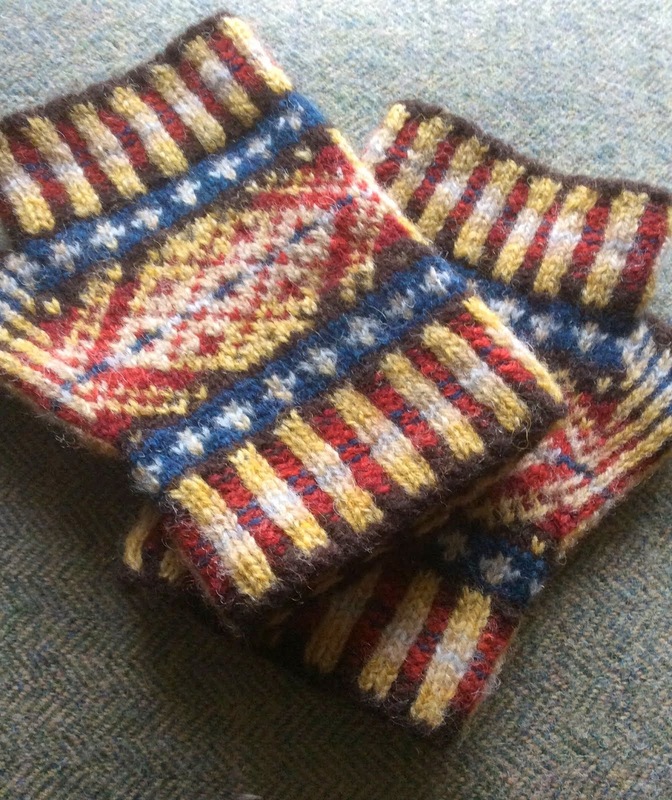 I really am pleased with the results, she's something beautiful for me to look at which is very satisfying, but it also feels good to have rescued a little bit of family history for posterity (or at least having saved dad the cost of doing so). Post 1000, It's about Cake. I have a (small) stack of books waiting to be written about, but post number 1000 probably deserves cake, and I'm quietly pleased (delighted, and want to shout about it) that after turning out disappointingly dry Christmas cakes I've managed to come to terms with my newish fan oven and got it right again. Fruit cake, like marmalade, is something I've only come to really appreciate in the last decade or so, and given the wintery turn the weather has finally taken it doesn't hurt that it pairs as nicely with a modest dram as it does a cup of tea. 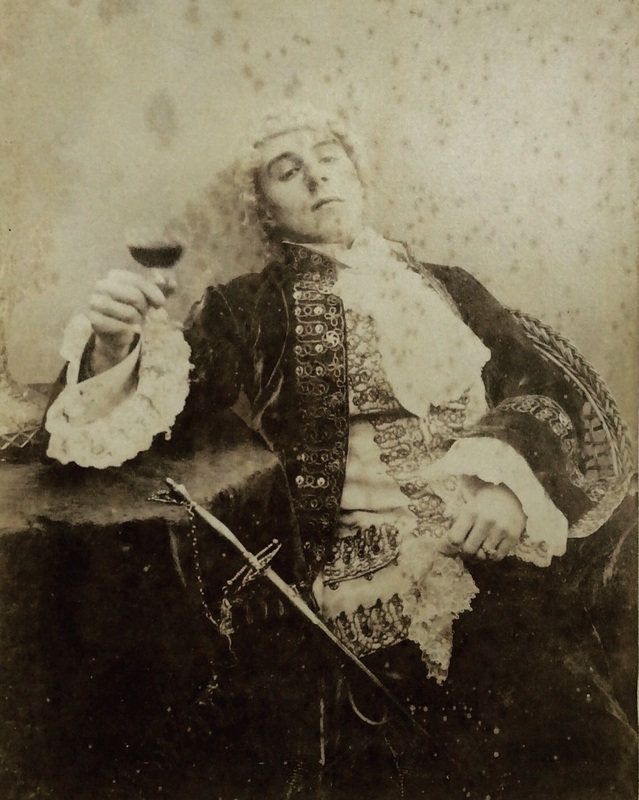 Facing the rest of February without the prospect of tea AND cake - to miserable to contemplate. I also had quite a lot of dried fruit left over, and it needed using for something. The cake in question is the caramel fruitcake from Dan Lepard's 'Short and Sweet'. It tastes great (even when it's a bit on the dry side) but just as important is that the fruit doesn't need to be soaked first so it's entirely practical to make it whilst waiting for marmalade to set, and that it's a recipe that allows for plenty of variation. Next measure 200g of caster sugar and 50ml of water, stick them in a heavy based saucepan and boil hard for 5-6 minutes until it's cooked to a dark reddish brown (don't stir, but give the occasional shake), remove from the heat and stir in 150ml of double cream (it boils like crazy, so be careful) then add 100g of mixed black treacle and honey (maple syrup works well as an alternative to the honey I'd just run out of) 4 teaspoons of mixed spice, 100g of butter, and optionally the grated zest of an orange and lemon (always at Christmas). When the butter has melted put the mixture in a bowl, add 250g of plain flour, quarter of a teaspoon of bicarb of soda, and 3 medium eggs, mix well and add the fruit and nuts. A conventional oven should be 170 degrees C, gas mark 3, a fan oven seems to want to be about 140, the larger cake should take roughly two and a half hours to cook and it's done when a knife comes out basically clean. Every year about this time I wonder if it would make more sense to just buy it as I needed it, but the discovery of marmalade coincided with the discovery that I love making jam, and home made is better (it is, isn't it?). In the summer when looking for something unrelated I will inevitably find a stash of last years marmalade and realise that I have about 2 dozen jars lurking around the place, I'll then swear I truly won't make another batch next year, but when I see those oranges I just can't resist. Right this moment however... I prefer the method where you boil the fruit whole for an hour or 2 to soften it then chop it up, I find it easier to get a reasonably fine cut that way, and the pips seem easier to extract. So yesterday that's what I did, but by the time the chopping was done it was later than I thought so I left it until today to boil it up. After a long day at work it wasn't something that I really wanted to do, but I comforted myself with the promise that the recipe says it should take about 20 minutes after reaching boiling point yo get yo setting point. It didn't. It took 2 hours. The thermometer promised me I'd reached setting point after *only* an hour and a half, and the wrinkle test was promising, but I realised as I poured it into the jars that it really wasn't right, so back in the pan it went. I'm not sure if I should have re sterilised the jars or not. I didn't so I'm hoping for the best on that. 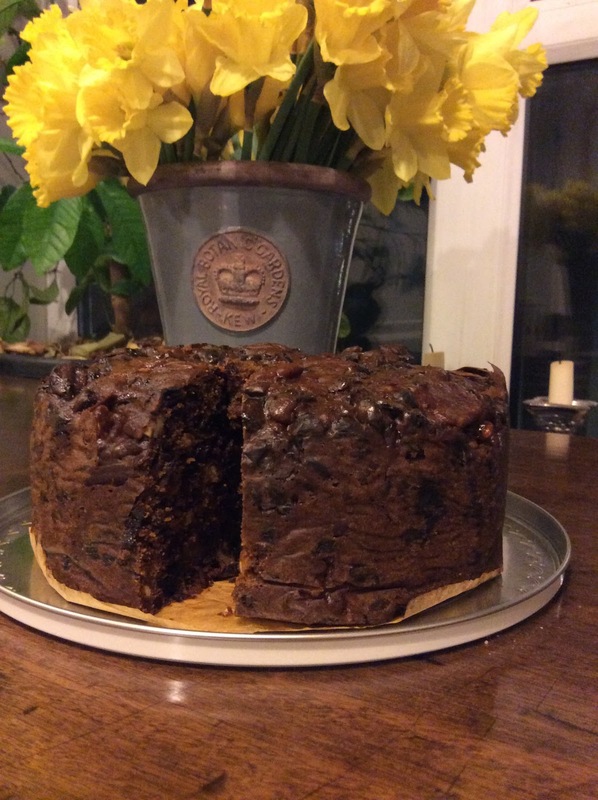 I spent so long waiting for it to boil up that I had time to make a fruit cake (well, what else could I do?). I finally finished my Christmas cake yesterday, and will miss it, dry as it was. The one currently baking is an attempt to try and better understand the oven, as well as a replacement - it's got an interesting mix of fruit in it, but with luck will turn out okay. Much the same as the marmalade really. Still, regardless of the effort, the risk of burns (very real), how sticky everything now is (very sticky), how much long it takes (so long), and an aching shoulder... It still has to be homemade, and tomorrow when I see all those jars lined up at breakfast time it'll all feel worth it (I hope). Never mind, our first RSC trip of the year has fulfilled a 25 year old ambition to actually see the play and I couldn't have been more excited about it. I loved studying this as a teenager, and still find the idea of selling your soul to the devil (an ill advised thing to do) fascinating. What would your own personal price be? 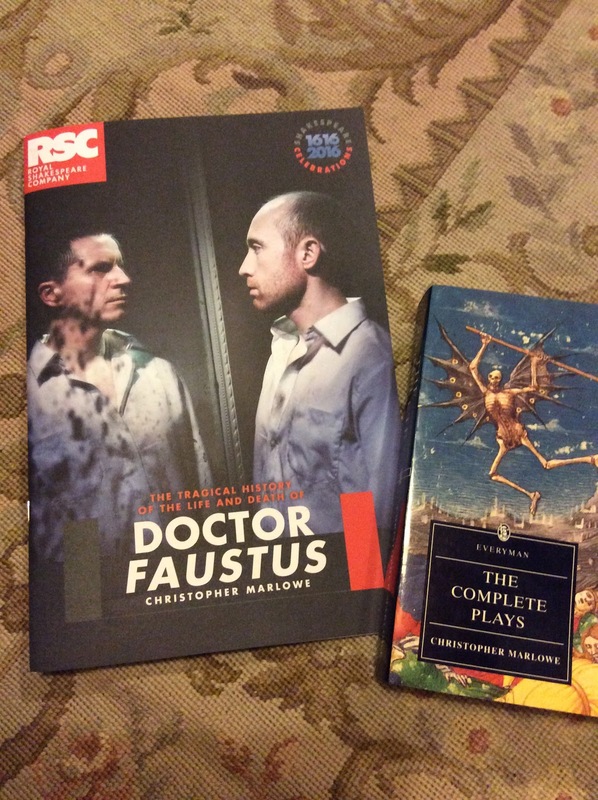 Perhaps sensibly most of the low comedy sections have been ditched for this production, and as there's no interval either, there really are no distractions from the central relationship between Faustus and Mephistopheles. The night we went Faustus was played by Sandy Grierson, with Oliver Ryan as Mephistopheles but I see from the programme that both actors are playing both roles (I'd love to go back and see them switched round, but doubt I'll get the chance) which is intriguing. I like the idea of them being interchangeable, and the pair certainly have a compelling chemistry on stage that contributes to a genuine sense of menace around what's going on. R's first comment as we came out was that parts of it had been truly frightening, and I quite agree with her. The music did it for me; there is a bit by the composer in the programme where he states that what they were looking for was "a mixture of the seductive and repulsive" something exciting, but also "sleazy, brutal and frightening" and that's what we got. It's on until August and well worth the trip, it was also worth my personal 25 year wait. 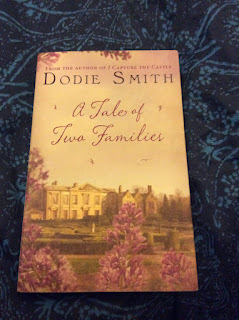 I bought this book partly because it had such an awful cover - I've been lucky that way before with Hesperus (the L M Montgomery titles they've published have two of the nastiest covers I've ever seen, both are wonderful books) so it seemed worth taking a chance on this Dodie Smith. 'A Tale of Two Families' was first published in 1970, and as with Stella Gibbons 'Pure Juliet' it took a moment to adjust my expectations - in this case from the world if 'I Capture The Castle', or even '101 Dalmations'. 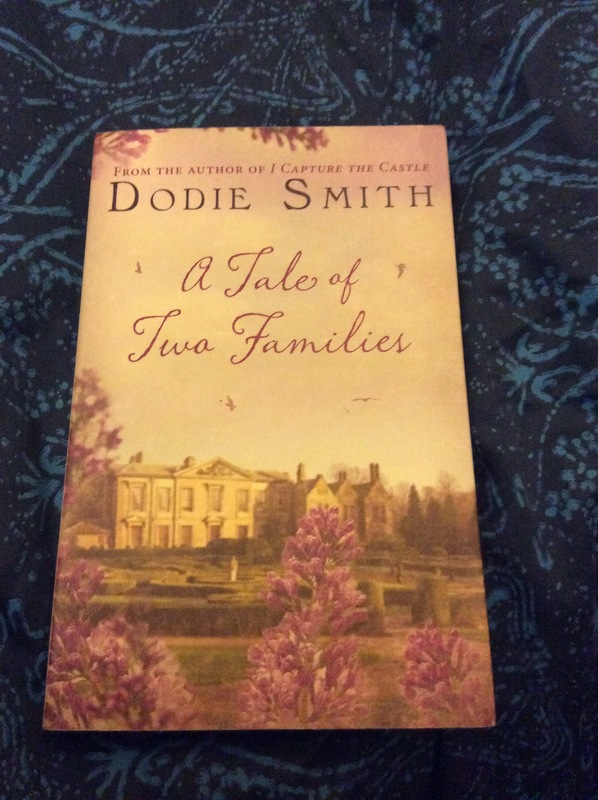 When I had adjusted (it didn't take long) I really enjoyed 'A Tale of Two Families'. It's an odd little book; two sisters, May, and June, have married two brothers, George, and Robert. George is very successful at something in the city so he and May have plenty of money, Robert is a respected writer and critic but not financially successful. George also has a wondering eye. Fed up of his affairs taking place under her nose, but equally determined not to make a fuss, May has decided it's time to leave London for a house in the country. Having identified a suitable house she also decides that June and Robert should move with them. May and George are almost, or so it seemed to me, oppressively generous, so much so that initially it seemed that would be the real cause of friction within the family, but I was wrong. The situation Smith sets up is a little odd, but not impossible (I know sisters married to brothers) and once in it everyone behaves as they might - apart, perhaps, from the crazy maiden aunt. She's believable but also really disturbing. Otherwise it's a book where the most of the drama centres on small things; a missing dog, too much asparagus, an ageing woman realising she's truly no longer young, and they're all as important and absorbing as the bigger things that happen. It's not another 'I Capture The Castle' but it is an unexpectedly charming book, or at least for me it's a book that's charming in unexpected ways. Hesperus - don't judge by the cover - and if it a stinker, take a chance on it. I love the idea of using flowers in cooking, it seems like such a magical thing to do - to capture the colour and scent of something then introduce it quite unexpectedly into a meal. 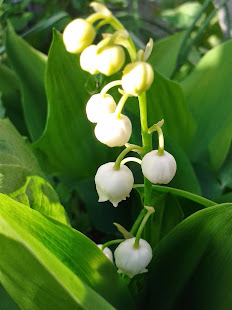 In practice most of my friends and relations are deeply suspicious of any such attempts on my part, considering the garden to be the proper place for flowers, not the kitchen. They are, of course, wrong. 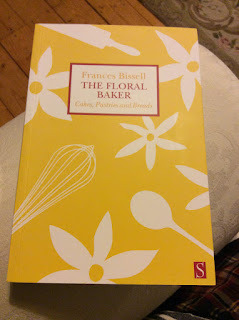 I have Bissell's earlier book on cooking with flowers 'The Scented Kitchen', which if nothing else has made me plant all sorts of things in D's garden (frustratingly I never seem to be there when whatever it is finally flowers). I wish I had more success with pinks - I love their clove scent, but they won't thrive for me. I haven't used it as much as I might, but there are some really lovely jams in there, and I seem to remember the macaroon recipe being a winner. 'The Floral Baker' was a (much hinted for) Christmas present from my sister - who must have bought it through gritted teeth, as she certainly disapproves of flowers in food. The flower that features most prominently is lavender (I counted 36 recipes in the index, which puts it well ahead of any if the others), this makes sense. Used in moderation lavender has a subtle smokey flavour that compliments all sorts of things both sweet and savoury. It's reasonably main stream now. Waitrose sells lavender shortbread, along with jars of lavender flowers in the herb and spice section. It works especially well with chocolate or lemon, and there's no shortage of inspiration here. Apple and rose petal scones sound like the perfect thing for any girly tea party (at least I hope it's the sort of thing that small girls would still be charmed by). Sloe gin cake - a proper fruit cake scented by rose water and rose sugar, then fortified by sloe gin sounds like an altogether more grown up treat and is something I'll make as soon as my Christmas cake is finished (so not this week at least). The idea of using jasmine in baking strikes me as pure Arabian nights (come the summer...). There are also all sorts of things with saffron including chorizo, saffron, and manchego muffins, and saffron cider bread, both of which sound rather more earthy (maybe even macho) than the other recipes I've tagged to make so far, and will surely win over a few flower sceptics.